Born in 1960 and growing up in the space era, Jeff Barr (M.C., 2013) said it was only natural that computers and technology captured his attention. He remembers doing projects with his grandfather when he was really young, and his dad bringing home chip manuals and microprocessors from his electronics distribution jobs. Little did he know that a part-time, high school gig at a local computer store would evolve into him becoming a present day Chief Evangelist for Amazon Web Services (AWS). Barr’s main work product is the AWS blog, which he started in 2004 and has now written more than 2,000 posts. While acting as somewhat of a spokesperson for the company, he also strives for the human element and creating content that shows personality. Barr said his storytelling improved after earning his Master of Communication in Digital Media degree from the Communication Leadership program in 2013. Originally involved as a member of the advisory board, he sat in on a few classes as part of his board duties and realized he could benefit from becoming a student of the program. Jeff Barr with his wife of 32 years, Carmen. In addition to the thought of learning interesting and useful course material, Barr had a second motivation that was more indirect: his five children. Not able to pick a favorite class, Barr said that even classes he thought would be fairly tedious ended up being useful and fun. Barr said he was impressed that all the instructors, professors, and lecturers were living what they were teaching with direct experiences to share, adding to the credibility and relatability. With one class to go in the spring, Barr decided to do an independent study project where he drove 5,550 miles around the country to present AWS to small user groups in 14 different cities. The journey provided him with a unique opportunity to establish strong connections with current and potential customers in a way that large-scale technology conferences don’t allow. With waking up at 5 a.m., driving 300 to 400 miles a day, continuing to blog as promised to his manager back in Seattle, and doing daily presentations, the days were long. But Barr said he was pleasantly surprised at the generosity of people who would offer to help by making sure he was taking the best route, suggesting good restaurants, and arranging the presentation times and places. He described the trip as a “peak experience” in his life. Comforted by the fact that he was among many students that were of a similar age, who were also juggling full-time jobs and families, Barr expressed a deep gratitude for the ‘we are all in it together’ attitude among his peers. Jeff Barr with his backyard wood-fired pizza oven. All photos courtesy of Barr. In addition to his career and schooling, Barr has become an advisor and financial benefactor to Seattle-based Redlight Traffic, which publicizes and fights human trafficking by using a mobile app to identify victims. He said the passion of his two good friends Amin Haq and Jessica Smith was infectious. The cause hits close to home as Barr is a big family man, raising five children (now between the ages of 19 and 29), and taking on the title of grandfather of two little ones. Born on the East Coast, he and his wife moved to Seattle in 1997 while he worked at Microsoft – and they haven’t looked back. And as a true MCDM grad and lover of social media, the Barr family wood-fired pizza oven has its own Facebook page. Barr has added growing pizza toppings in his garden to his list of favorite outdoor activities. 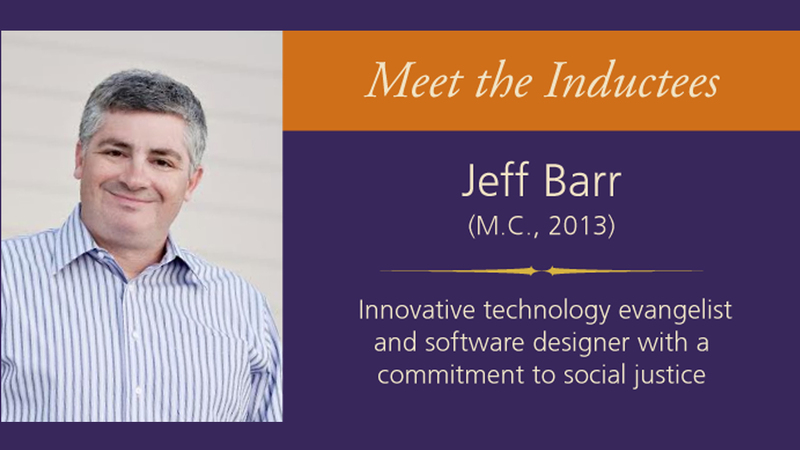 Jeff Barr is a 2014 inductee to the UW Communication Alumni Hall of Fame. For more information about the event, click here.